TBILISI, DFWatch–Georgian and Russian trade experts will meet in Prague on July 7 to find out how compatible Georgia’s new free trade with the European Union is with its already existing free trade framework with countries of the former Soviet Union. The announced trade talks will be held two days before the next round of direct talks between a Georgian and a Russian diplomat, also in Prague. 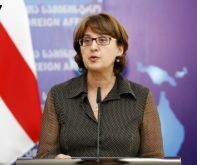 Three days after her country signed a so-called association agreement with the EU, which includes free trade, Georgian Foreign Minister Maia Panjikidze told journalists Monday that Georgia is interested in having ‘intense’ trade with EU member states, but also do trade with the Commonwealth of Independent States (CIS), which consists of former Soviet countries. Georgia still has free trade with CIS countries, although leaving the organization after the 2008 war in protest against Russia’s military actions. “We must now sit down and see if something has changed after Georgia joined the new trade space,” she said, referring to last Friday’s signing ceremony in Brussels. July 9, there will be a meeting between Gregory Karasin, Russia’s Deputy Foreign Minister, and Zurab Abashidze, the Prime Minister’s Representative for Russian Relations, according to Panjikidze. She said the experts who are meeting two days prior will sum up their positions regarding the new rules which now are open for Georgia and how compatible these are with the free trade rules which Georgia has with CIS countries. “This is an ordinary technical working meeting, which is very good,” she said. Georgia is sending a team of three from its Ministry of Economy, according to Zurab Abashidze. “We are concerned about Russian interests, also the states which are in the Custom’s Union, Belarus and Kazakhstan. They try to assure us that nothing bad will happen and Russia, like Ukraine, will find benefits,” he said. Panjikidze said her Russian colleague’s statement does not contain anything new, and is related to the signing of association agreements with the EU. Swedish Foreign Minister Carl Bildt, who is on a visit to Georgia, said on Monday after meeting his Georgian colleague that he doesn’t see the need for European Commission representatives taking part in the expert meeting on July 7.